What is a Drum Recorder? Drum recorders, like the ones pictured here, draw a seismogram on a piece of paper wrapped around a slowly revolving drum. As the drum revolves, the pen shifts across it, making a big spiral or helical record that eventually fills the entire page. When the paper is removed and laid flat, the record appears to be many horizontal lines, like lines in a book. These mechanical recorders, popular 30 years ago, have largely been replaced by computers, which digitize the data (typically at 100 samples per second) and store it in digital form. The digital data can then be displayed in a variety of ways by the computer. Here, we've displayed the data to look like the old-fashioned paper records that drum recorders produced. Pictured here are Helicorders®, a common type of drum recorder, manufactured by Geotech Instruments, LLC. The seismograms displayed are from a few of the seismograph stations routinely recorded by the Northern California Seismograph Network. 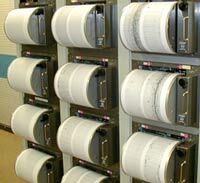 Each is a record of how the ground moved at a particular seismograph station in Northern California during a 24-hour period. The plots are "magnified" according to the level of background or ambient seismic noise, which is generated by wind, cultural disturbances and oceanic microseisms. Thus, some sites appear noisier than others. The seismogram is "read" like a book, from left to right and top to bottom (this is the direction that time increases). As with a book, the right end of any horizontal line "connects" with the left end of the line below it. Each line represents 15 minutes of data; four lines per hour. The colors of the horizontal lines have no particular significance; they are used to make it easier to distinguish lines from one another and to make it easier to recognize at which quarter-hour of data we are looking. The vertical lines are not part of the seismogram. They were added to indicate equal intervals of time. Time is indicated on the left in local Pacific time, and on the right end in Universal (or Greenwich) time. When an earthquake occurs the seismogram will show ground motions that typically last from several tens of seconds to many minutes, depending on the size of the earthquake and the sensitivity of the seismograph. The height of the recorded waves on the seismogram (wave amplitude) is a greatly magnified representation of the actual ground motion. A recording of an earthquake has recognizable characteristics. Typically, one can recognize the arrival of different wave types: P (the fastest traveling waves), S (shear waves), and surface waves. On these seismograms you may see local earthquakes in Northern California and earthquakes elsewhere in the world. Not all the wiggles seen on the seismograms are due to earthquakes. Anything that produces ground vibrations could be recorded, for example a car that passes by the seismometer (this is why we try to locate most of our seismometers well away from roads). Since the electrical signals from the seismometers are typically transmitted to the USGS by microwave or over telephone wires, electrical and radio noise on the transmission path may also show up on the seismogram. Such interference is usually easy to distinguish from earthquake-generated signals because it is often erratic or "spikey" in appearance. Each data channel has a three part name such as MSL VHZ NC. The first part identifies the station. The middle part describes the data. The last part identifies the seismic network. The station name and network uniquely identify the location where the data are being recorded. The data descriptor tells a) what is being measured (velocity, displacement, acceleration), b) what sort of instrument is doing the recording (digital, hi-gain analog, etc. ), and c) the orientation of the sensor (vertical, horizontal-north-south or horizontal-east-west). For example, VHZ is a high-gain (sensitive) analog velocity sensor, sensing vertical movement. Examples: MSL, HSF, JSF, etc.